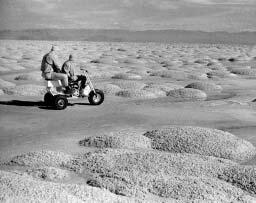 Algal stromatolites exposed near the shore of Stansbury Island during the lake-level low of 1964. 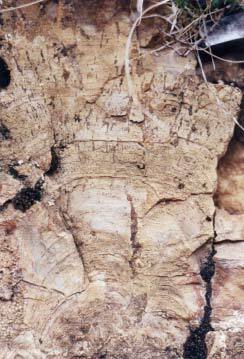 In September 2002, the Utah Geological Survey (UGS) completed a four-year study of the oil-productive Green River Formation in northeastern Utah. Objectives of the project were to increase oil and gas recovery through improved characterization of the formation. The project included examination and interpretation of both the surface (rock exposures) and subsurface (well logs and cores) data. The Green River consists of hundreds of meters of interbedded sandstone, limestone, and mudstone that were deposited in ancient Lake Uinta and along, or near, the shores of the lake, which occupied the present-day Uinta Basin 55 to 45 million years ago. Examination of fossil blue-green algae in the Green River was a very small, but interesting part of the project. Beds composed of fossil blue-green algae are commonly laterally extensive and can often be correlated from one exposure to another, providing good marker beds. The algal beds rarely are oil and gas reservoirs, but they can be used to help interpret depositional patterns and are often closely associated with the oil-productive beds within the formation. Blue-green algae are one of the earliest life forms and have grown in fresh and salt waters since the Precambrian (3.5+ billion years ago). Blue-green algae are not true algae, but are cyanobacteria which are neither true plants or animals and, like bacteria, have no cell nucleus. Much of what comprises common pond scum is a present-day form of blue-green algae. Blue-green algae are the most abundant fossils in the Green River Formation in Nine Mile Canyon, and the most abundant life form in Great Salt Lake. 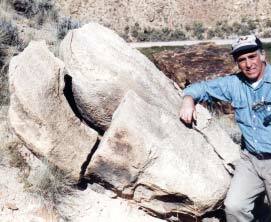 Fossil blue-green algae in the Green River Formation are commonly found as beds of algal mats or stromatolites. An algal stromatolite is a rock structure produced largely by growing blue-green algae that trapped and bound sediment. Stromatolites in the Green River are typically dome shaped, ranging from small cabbage-like heads a few centimeters (inches) in diameter to large domes up to 1.5 meters (5 ft) wide and 0.5 meters (1.5 ft) high. An encrusting form of blue-green algae can be found where it grew on the tops of stromatolites and around tree trunks in swamps. Stromatolites are currently growing on the gently sloping floor of Great Salt Lake at shallow water depths where the blue-green algae receives sufficient sunlight for photosynthesis. 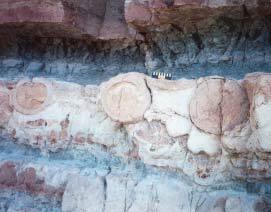 Fossil algal stromatolites in the Green River Formation grew in a similar setting, on a gently sloping, shallow fresh-water lake bottom. Stromatolites can form a low-relief but extensive biostrom in a lake. 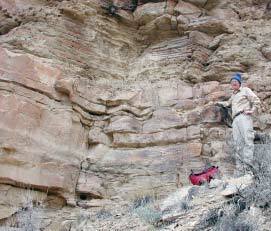 For example, a bed in the Green River Formation known as the C marker, in Nine Mile and Desolation Canyons northeast of the town of Price, contains well-developed stromatolites at most locations where it is exposed. The C marker biostrom may have covered more than 300 square kilometers (180 mi2) along the southern shoreline of ancient Lake Uinta. Glad You Asked: How do geologists identify minerals?